When you see the name Pigs Pigs Pigs Pigs Pigs Pigs Pigs, you may think of them as a joke. When you hear Pigs Pigs Pigs Pigs Pigs Pigs Pigs music, you will know them as a fierce and structurally solid powerhouse. Rhys Delany experienced this first hand. 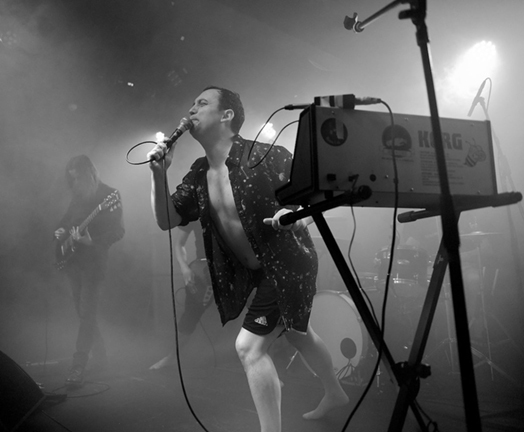 The tail end of 2018 saw the release of the second LP by the Geordie quintet, King of Cowards. The record was released for Rocket Recordings, whose current roster boasts groups such as Hey Colossus, Goat and GNOD. So you can expect an almost psychedelic, doom-heavy, freak out tour de force. The first point of entry when seeing Pigs Pigs Pigs Pigs Pigs Pigs Pigs is the methodical bass lines courtesy of Jean-Michael Hedley. Crunching it’s way through a cacophony of sound assisted by duelling guitars via Sam Grant and Adam Ian Sykes. The set opens with riff-heavy GNT, from their second album. Baty proves to be in fine, shirtless, form as he bellows the phrase ‘King of Cowards’, while holding the microphone in a bow and arrow-esque pose as he takes aim at the audience.